ALL THIS IS THE BRAHMAN; THIS SELF IS THE BRAHMAN AND THE SELF IS FOURFOLD. BEYOND RELATION, FEATURELESS, UNTHINKABLE, IN WHICH ALL IS STILL. What is the relation between the three poises of Reality described by Sri Aurobindo and the four-fold nature of Self described in the Mandukya Upanishad? Reality or Brahman can be perceived in many ways. If it is experientially perceived in an existential mode, it is known as the Self. Sri Aurobindo describes that Reality is simultaneously perceived in the Individual, Universal and Transcendent poises. In the Individual poise, Consciousness is concentrated within the limits of Space and Time so that a particular creative drama can be enacted. In the Universal poise, Consciousness is diffused beyond the constraints of Space and Time so as to complement the Individual poise. The Transcendental poise surpasses both the Individual and the Universal, permits them, exhausts them and is yet independent of them. The first is ‘He whose place is the wakefulness, who is wise of the outward, … who feels and enjoys gross objects, Vaishwanara, the Universal Male’. This is the sense-bound ‘personality’ in contemporary psychological parlance, external self in conventional yogic terminology and ‘outer being’ in Aurobindonian terms. The second is ‘He whose place is the dream, who is wise of the inward…who feels and enjoys subtle objects, Taijasa, the Inhabitant in Luminous Mind’. This is what Sri Aurobindo names as the inner or subliminal being. The inner being is connected with the cosmic consciousness. It is also connected with the outer being through channels of communication known as chakras. The inner being has subtle senses and is capable of suprarational modes of acquisition of knowledge. The third is ‘When one sleeps and yearns not with any desire, nor sees any dream, that is the perfect slumber. He whose place is the perfect slumber, who is become Oneness, who is wisdom gathered into itself, who is made of mere delight, who enjoys delight unrelated, to whom conscious mind is the door, Prajna, the Lord of Wisdom, He is the third’. This is the inmost being, the being of desireless delight, who has no motivation to exist but for the sheer, unalloyed joy of existence, the being who from behind projects the frontal personality, the being who carries the essence of oneness but supports the myriad, conflicting divisions of our external nature. The fourth is ‘He who is neither inward-wise, nor outward-wise, nor both inward- and outward-wise, nor wisdom self-gathered, nor possessed of wisdom, nor unpossessed of wisdom, He Who is unseen and incommunicable, unseizable, featureless, unthinkable, and unnameable, Whose essentiality is awareness of the Self in its single existence, in whom all phenomena dissolve, Who is Calm, Who is Good, Who is the One than Whom there is no other, Him they deem the fourth: He is the Self, He is the object of Knowledge’. This is the self that is poised above the manifestation. It supports the manifestation but is itself detached. It can be experientially perceived through the central being that projects the impersonality dimension that in turn upholds the personality. While Western psychology studies the being in terms of ‘personality’, yoga psychology studies the being both in terms of ‘personality’ and ‘impersonality’. The four-fold nature of the Self has to be studied against the background of the three poises of Reality. Actually, at each poise of Reality, the Self has stress on one or other aspect of its four-fold nature. At the Individual poise, there is more stress on the outer being at the level of psychological understanding and the inmost being at the level of spiritual growth. At the Transcendental poise, the Self has more stress on the impersonality dimension experienced through the central being where metaphysics overtakes psychology. At the Universal poise, there is more stress on the inner being. The inner being can connect with the ‘collective unconscious’ of Jungian psychology at one level and with the ‘cosmic consciousness’ of the mystics at another level. It is the meeting ground of fantasy and pragmatism, of psychology and mysticism, of science and spirituality. 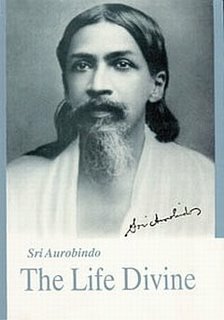 Sri Aurobindo’s Integralism moves along different perspectives. The four-fold nature of the Self has to undergo integration and this integrated Self has to be studied at different poises of Reality. The three poises of Reality have to be themselves integrated. This multiple movement also leads to an integration of metaphysics and psychology. Such a complex mosaic of Integralism provides the gestalt to support the emergence of higher, progressively integrated evolutionary models of human being. This is the Almighty, this is the Omniscient, this is the Inner Soul, this is the womb of the Universe, this is the Birth and Destruction of creatures.